Global Pond Liners Market expected to reach approximately USD 2,100 million by 2024 and is expected to exhibit a CAGR of more than 8.5% between 2017 and 2024. Based on the raw material, polyvinyl chloride (PVC) segment holds the largest share in global pond liners market followed by ethylene propylene diene monomer (EPDM). The report covers forecast and analysis for the pond liners market on a global and regional level. Detailed information and future opportunities about the market are discussed. The pond liners market has been analyzed using Porter’s Five Forces Analysis. The market is segmented on the basis of raw material, the density of the material, services, manufacturing method, end-use industry, and applications which in turn are bifurcated on a regional level as well. The report deals with the in-depth quantitative and qualitative analyses of the pond liners market. Pond liners are impermeable geomembranes that are utilized for lining the reservoirs and retention basins. Pond liners are designed to prevent the liquid leakages; they have very low permeability rate. The global pond liners market was valued more than USD 1,000 million in the year 2016 and it is expected to reach approximately USD 2,100 million by 2024. The global pond liners market is expected to exhibit a CAGR of more than 8.5% between 2017 and 2024. The growing applications of the geomembranes are increasing the demand for the pond liners market. Since the pond liners help in preventing the soil erosion and water wastage they are increasingly used in the artificial water constructions. The pond liners are widely used for containment, collection, and the conveyance of drinking water thus driving the growth of pond liners market. Moreover, the pond liners serve better than natural clay liners, when it comes to pond and lagoon liner applications. Increasing availability of substitutes for pond liners such as geosynthetic clay liner in landfill and lining systems is expected to pose a threat to the pond liner industry. Moreover, the increasing demand for the bituminous membrane in waterproofing and landfill also anticipates arresting the growth of this industry in the near future. Based on the raw material, polyvinyl chloride (PVC) segment holds the largest share in global pond liners market followed by ethylene propylene diene monomer (EPDM). Polyvinyl chloride (PVC) accounted for a significant market share of above 27% in 2016 due to its cost-effectiveness and tremendous resistance against punctures, scratch, and industrial chemicals. By using polyvinyl chloride (PVC) a wide range of field seaming choices is offered such as a hot wedge, dialectic processes, chemical, and hot air. Furthermore, additional benefits such as ease of installation and long durability will contribute to the increasing popularity of polyvinyl chloride (PVC) during the forecast period. By density of the material, the market for HDPE (High-Density Polyethylene) segment is expected to witness the highest growth rate in the forecast period. High-density polyethylene has the modest economic and operational advantages and also has high puncture resistance. The HDPE segment anticipates registering the highest CAGR of around 9.2% over the forecast period. 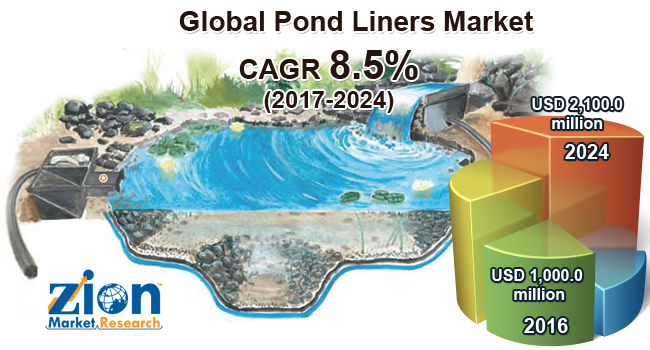 Whereas, LLDPE (Linear Low-Density Polyethylene) held the second largest market share of more than 25% in 2016 in terms of revenue in global pond liners market. By service type, the deployment and integration services held the largest market share of more than 45% in 2016 in the global pond liners market. As this segment anticipates witnessing the highest CAGR the segment will retain its dominance in the forecast period. However, there will also be an increasing demand for the support and maintenance services owing to the growing need for after installation services in pond liners industry. This segment anticipates registering a CAGR of more than 9% over the forecast period. Based on the manufacturing method, the global pond liners market is divided into extrusion and calendaring method. Among them, the extrusion method is expected to dominate the global pond liners market owing to the short production runs and increased flexibility that is provided by this method in comparison with the calendering method. The extrusion manufacturing method held more than 50% of the market share in 2016. It is anticipated that this dominance will be retained in the forecast period. Oil spill containment is one of the important end-user segments for pond liners. This segment contributed the highest market share of more than 35% in 2016. Increasing concerns regarding the high contamination of water bodies due to oil and other hazardous greasy compounds contribute to the growth of the segment. The oil spill containment segment is anticipated to register a significant CAGR in the forecast period due to the increasing mining industry activities. Among the other end-user industries, potable water segment anticipates growing significantly over the forecast period. By application, the mining segment attributes to contribute a significant share in the pond liners market owing to the increased applications of the pond liners in leach pads, tailing dams, etc. The mining segment contributed a major market share of more than 28% in 2016 and is also expected to register the highest CAGR in the forecast period. The waste management segment also attributes to growing at a rapid rate in the forecast period with a CAGR of more than 9%. North America dominated the pond liners market with a significant share of around 35% in 2016. The increasing adoption of the pond liners in the mining and the oil industry in the region contributes to the growth of the market. The market is growing at a rapid pace in the developing regions. Asia Pacific region is expected to register the highest CAGR from 2017 to 2024 owing to the increasing environmental awareness, water management activities, and increasing government initiatives for the waste management will propel positively the market growth. The report includes detailed profiles of the prominent market players that are trending in the market. The list of the players that are compiled in the report include AGRU, BTL Liners, Carlisle, Emmbi Industries Limited, Firestone, GSE Environmental LLC, HongXiang New Geo-Material Co. Ltd., Huadun Snowflake, HiTech Rubber, Isan Exim Plastomech Private Limited, Laiwu Zhongxing Geotextile, Mono Industries, NAUE, Nylex (Malaysia) Berhad, Officine Maccaferri, PLASTICA KRITIS SA, Reef Industries Inc., Seaman Corporation, Siddhivinayak Plastic Industries, Solmax International, Sotrafa, Stephans Industries Limited, and much more. The prominent market players maintain the competitive edge in the global market by making investments in the mergers and acquisitions. In March 2017, Emmbi Industries Limited launched Jalasanchay Brand pond liners for storing water at its newly acquired and furbished manufacturing facility at Silvassa.